The legendary fighters from the Dragon Ball Z animated series will be competing again when USAopoly releases the Dragon Ball Z Power Up! Board Game in late October. The Dragon Ball Z Power Up! 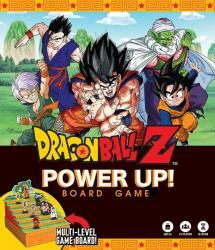 Board Game features a multi-level game board representing the path to �Level 10� that the fighters will compete over. Rising to the top tier takes more than strength, though, as players must outwit their opponents and plan their advancement carefully if they hope to defeat the dragon and earn the title of champion. In addition to the 3-dimensional game board, the game includes 87 cards, 13 standees representing characters from the series, a scoring pad, and tokens. Dragon Ball Z Power Up! is intended for 3 to 6 players, ages 8 and up, and plays in less than half an hour.